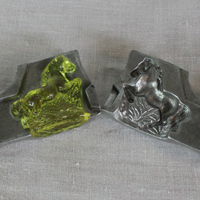 Boiling sugar syrup is hand poured into antique metal molds and pops out as tiny elephants, huge hens, fancy ladies, sailboats, and more, all in sparking, clear hard candy. 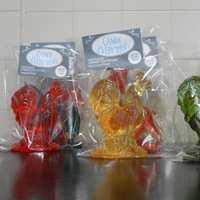 Traditional clear toy candies are three-dimensional candy figurines handmade from classic molds. These candies are still made in only a few places, most of which are in the Eastern United States. Our clear toy candy continues a family tradition that started in 1868. We use traditional techniques to turn sugar, corn syrup, and water—along with natural flavoring and colors—into figures. Candy Everything puts a new twist on traditional clear toy candy with figures, colors, and flavors that delight everyone. Visit us on facebook or at our website or on instagram @cleartoycandy. We will be joining the Beehive Bazaar- December 12-14.